Bugfixes: Memory issues caused corrupted data files in some cases that led to crashes. 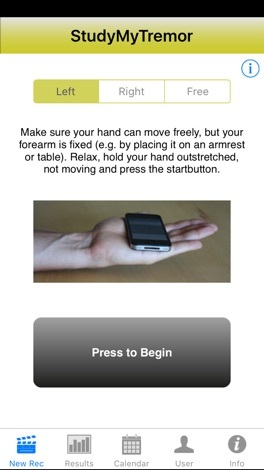 StudyMyTremor let you record, analyze, and track the trembling of your hand, the so-called "Tremor". This app uses a highly sophisticated, scientifically proven method to measure, analyze and track humand hand Tremors. The method has been used in more than 30 international clinical studies in the past 20 years. 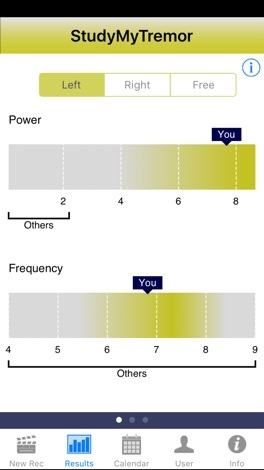 It gives you the ability to assess and quantify your tremor and to keep track of your values. You can upload your results as Text Files to your iCloud Drive for further visualization, or to share and import them to personal EHR apps. Tremor is the notion for the trembling of a limb. Most prominent is the trembling of the outstretched hand, that everyone is aware of in special situations like excitement or strenuous workouts. Whereas a light trembling of the hand is present in all humans, increased amplitude of the trembling can lead to serious problems in daily life. Increased trembling could be a symptom of a wide variety of diseases, as Parkinson's disease, essential tremor disease, hypothyroidism, or various psychiatric conditions. THIS APP IS NOT INTENDED TO DIAGNOSE, TREAT, OR CURE ANY DISEASE. Note: Tremor severity and frequency are not supported by iHealth; as soon as these values are available we will connect the App to the iHealth ecosystem. 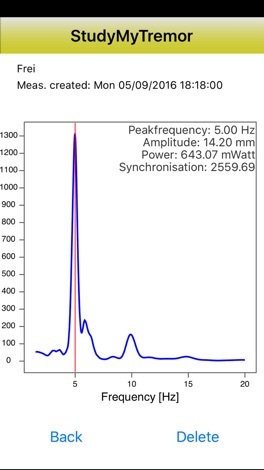 iPad Users: Note that the App is not working on the iPad; it does NOT make sense to measure hand tremor using an iPad, the device is too large and heavy to perform the measurements.